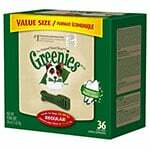 GREENIES Dental Chews Value Size Tub 36oz Large offer dogs a better chewing experience with the same great taste and dental benefits. New Greenies treats feature a new design with natural break points. GREENIES Dental Chews Value Size Tub 36oz Large offer dogs a better chewing experience with the same great taste and dental benefits. New Greenies treats feature a new design with natural break points. The natural break points assist dogs with biting off chewable pieces that dissolve easily in a dog's digestive system. 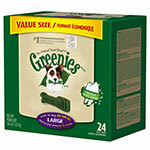 Greenies treats continue to help clean teeth, whisk away plaque and tartar, and eliminate offensive "doggie breath." 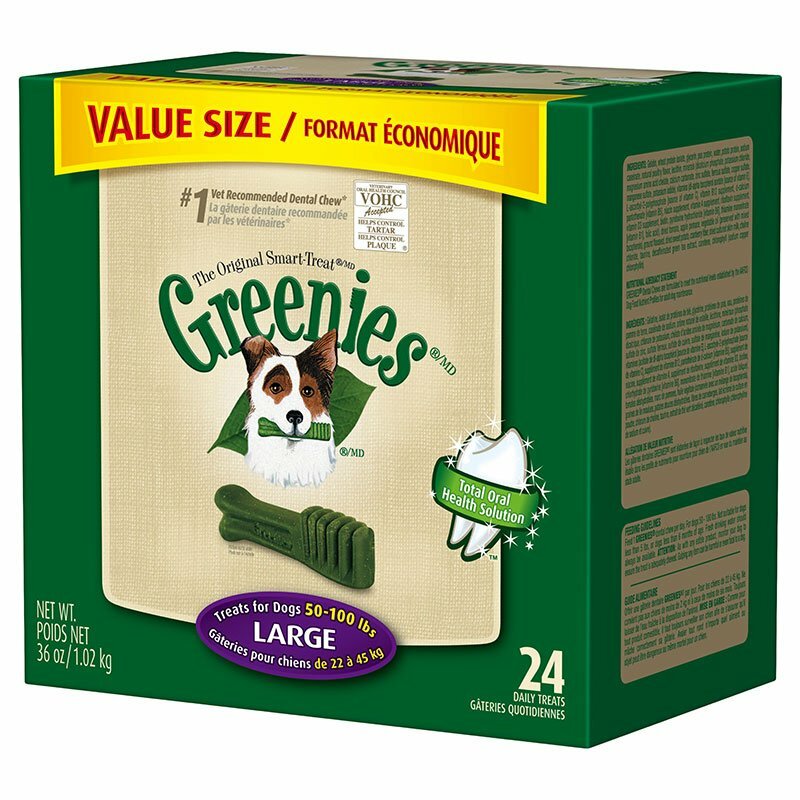 With vitamins and minerals to make Greenies 100% complete and nutritionally balanced for adult maintenance, this treat has the same great Greenies taste dogs love! All of our corn, soy and wheat gluten comes from North America and not China. None of our brands include rice gluten from the foreign suppliers linked to the recall. Our products have never been involved in any recall and all of our products meet or exceed industry standards for quality. You're cleaning your dogs teeth with every chewy and delicious bite. One new Greenies® dental chew a day helps control harmful plaque,tartar build up and freshens breath. Did you know that 80% of dogs suffer from dental disease by the time they're 3 years old? Pay attention to warning signs like bad breath, visible tartar building up at the gumline, red, swollen gums, excessive drooling or broken or discolored teeth. Your dog can't tell you they need a new Greenies® dental chew every day they're counting on you! You're giving your dog something that's nutritious and easy to digest. New Greenies® dental chews are filled with a unique blend of high quality, easily digestible proteins that begin to break down right in your dogs mouth. These proteins make new Greenies® dental chews so irresistibly chewy that dogs can't help but gnaw them into little teeth-cleaning, easy to swallow and digest bits. Plus, we've added vitamins and minerals to make them a complete and balanced part of your dogs daily diet. New Greenies® are the only dental chews designed in 5 distinct sizes and textures to match the natural chewing action of all dogs. Face it, dogs come in many shapes and sizes; some of them have a great deal of jaw strength to bite very hard things, and others don't. After a lot of study and research, we decided that making dental chews in small, medium and large sizes alone wasn't enough. Thats why New Greenies®dental chews come in five unique textures (softer ones for little dogs, harder ones for bigger ones) and 5 unique sizes to better care for all types of dogs. Same great Greenies Taste: One thing hasn't changed about new Greenies® dental chews they still have that irresistible tail-wagging taste that has made them a favorite of canines all over the world. Veterinary Oral Health Council (VOHC) exists to recognize products that meet pre-set standards of plaque and tartar retardation in dogs and cats. Products are awarded the VOHC Seal of Acceptance following review of data from trials conducted according to VOHC standards. The VOHC does not test products itself. The VOHC Seal is only displayed on products that have been awarded the seal. Tests have shown that regular use of products carrying the VOHC Seal will reduce the severity of periodontal disease in pets.